ENG: I'm not picky for colours and textures, and also I don't have the one and only casual bag, but I have dozens of favourite ones. My favourite Celine, favourite shoes and no single step without a sweater - definitely today was a good day. RU: Я не придирчива к цветам и фактурам, а еще у меня нету единственной повседневной сумки, зато есть несколько десятков любимых. Любимая Celine, любимые босоножки и ни шагу без свитера - сегодня точно был удачный день. 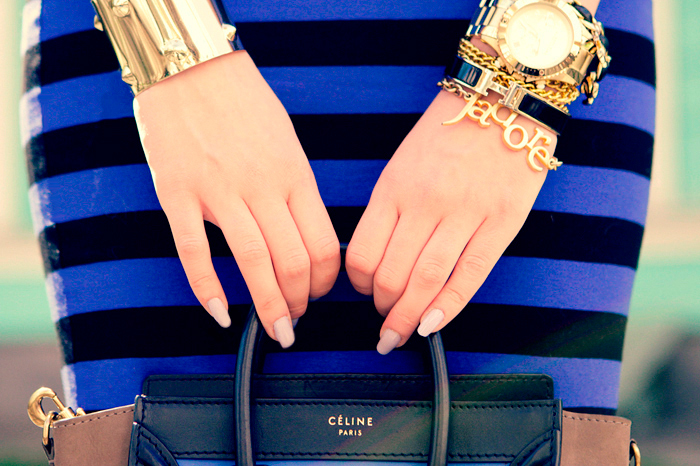 Beautiful look...Love the blue color that transcends all the pieces and holds all the wonderful craziness together! Superb outfit! Love so much the contrast of the pieces. Great outfit, I looove these bold colours! как здорово получается у тебя смешивать принты и цвета! Великолепно! I adore the J'adore braclet. Really cute! You are absolutely stunning and have an amazing taste in style. I love your eye candy and that bright knit! Thank you for your comment on my lookbook! I would love to follow each other via Bloglovin, wouldn't you? I'll wait for your answer on my blog! You look fab. The stripes, colours and houndstooth all go perfectly together. simply gorgeous¡¡ I love the contrast. I just got here in your Blog, Really wonderful ... this outfit is perfect, fantastic colors and pictures .. beautiful! I love the bold houndstooth and stripe look!!! This look is gorgeous!! Woow you are such an inspiration! Those prints match perfectly! I can only sigh , really beautiful.